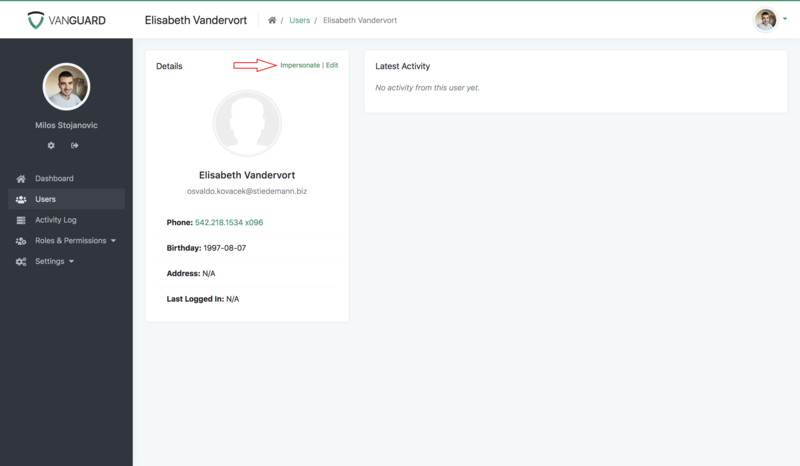 All Vanguard users with users.manage permission can impersonate other system users. This is a very handy feature when your users report some bugs and when you need to see the application exactly how they can see it. Instead of asking them for their credentials you can simply impersonate them. How to impersonate a user? While you are impersonating a user, you can do everything that the user can do himself. Once you are done and you want to return to your account and stop impersonating the user, just click on the "Stop Impersonating" button inside the header. If you want to customize who can impersonate other users or which users can be impersonated, you can do that by updating appropriate methods inside app/Support/CanImpersonateUsers.php file.